To the 1st Interrogatory she answers I am acquainted with the parties & have known them for so long as I can remember anything. the defendant is my sister. To the 2d Interrogatory she answers, the Petitioner is a slave and always has been. 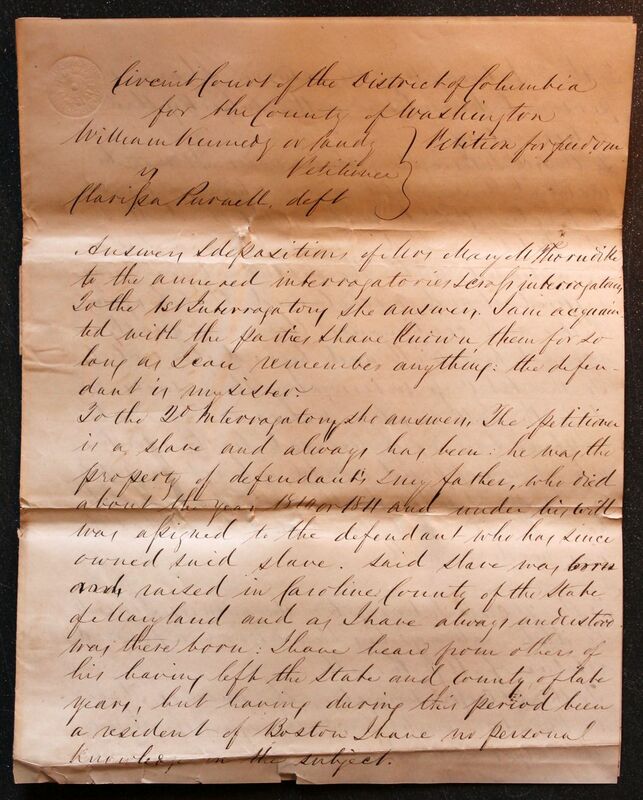 he was the property of defendant's & my father, who died about the year 1810 or 1811 and under his will was assigned to the defendant who has since owned said slave. Said slave was born and raised in Caroline County of the State of Maryland and as I have always understood was there born. I have heard from others of his having left the state and county of late years, but having during this period been a resident of Boston I have no personal knowledge on the subject. To the 3d Interrogatory she answers, I have no personal knowledge on the subject of this interrogatory. To the 4th Interrogatory she answers, It may be material to say that on my return, on a visit to Caroline County, on being informed that the petitioner had gone to Virginia, I remonstrated with the defendant for having suffered it and ascertained that his going thither and continuance there were greatly against her will and beyond her control. To the 1st Cross interrogatory she answers. 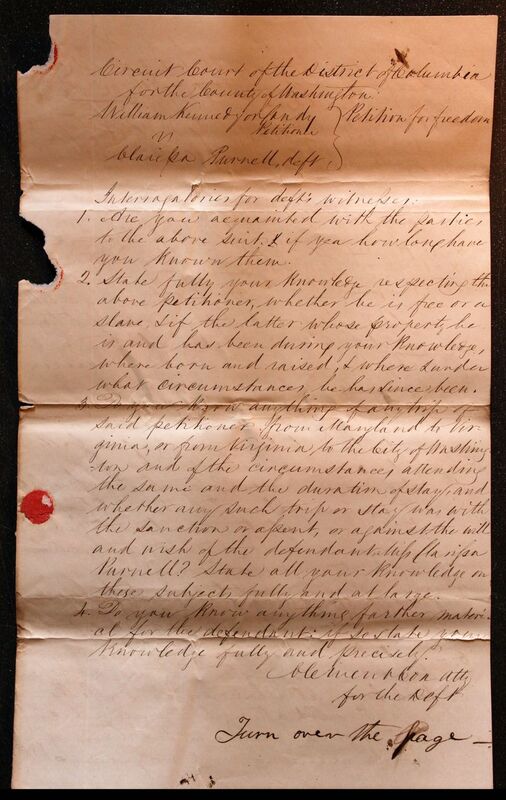 Miss Purnell has two sisters and several nephews & nieces of deceased brothers & sisters who it is supposed would inherit her property in the event of her death without a will. & I have the strongest reason to believe that she has made no will. 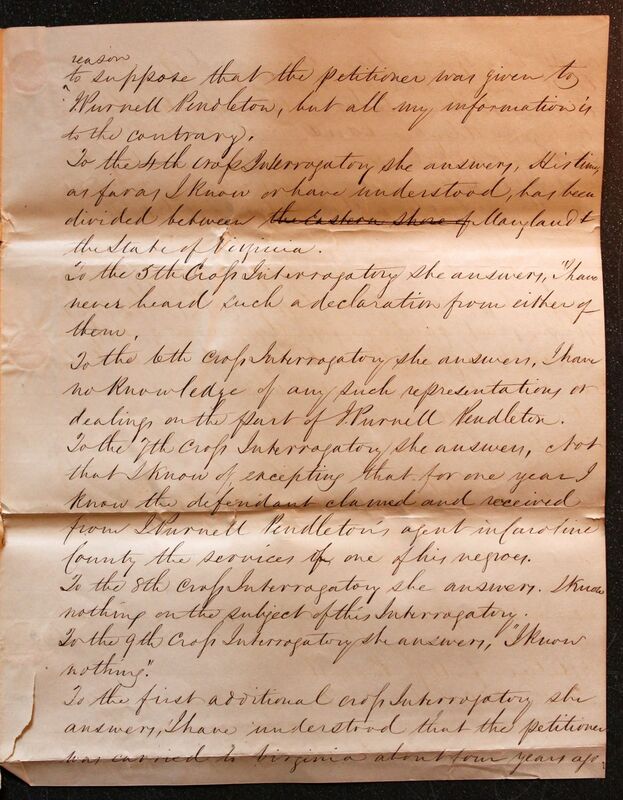 To the 3d Cross Interrogatory she answers, I have no knowledge except from the report of others on the subject of this Interrogatory, nor have I any reason to suppose that the Petitioner was given to I. Purnell Pendleton, but all my information is to the contrary. To the 4th Cross Interrogatory she answers, His time, as far as I know or have understood, has been divided between the Eastern Shore of Maryland & the State of Virginia. To the 5th Cross Interrogatory she answers, I have never heard such a declaration from either of them. To the 6th Cross Interrogatory she answers, I have know knowledge of any such representations or dealings on the part of I. Purnell Pendleton. To the 6th Cross Interrogatory she answers, I have no knowledge of any such representations or dealings or the part of I. Purnell Pendleton. 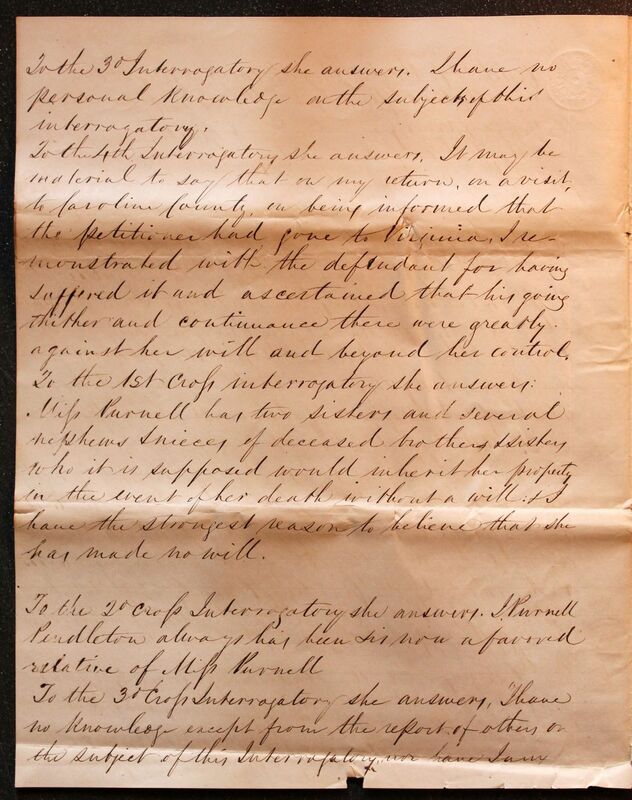 To the 7th Cross Interrogatory she answers, Not that I know of excepting that for one year I know the defendant claimed and received from I. Purnell Pendleton's agent in Caroline County the services of one of his negroes. To the 8th Cross Interrogatory she answers. I know nothing on the subject of this Interrogatory. To the 9th Cross Interrogatory she answers, "I know nothing." 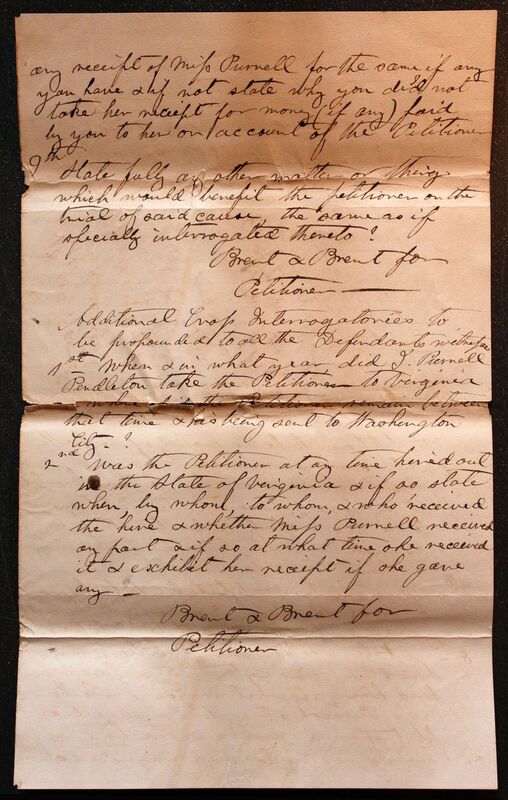 To the first additional Cross Interrogatory she answers, I have understood that the petitioner was carried to Virginia about four years ago and has since been there and in Maryland, never having been absent from the latter state more than six months at a time until he came to Washington. To the 2d additional cross Interrogatory she answers, I have no personal knowledge on the subject of this interrogatory. Taken and sworn to by Mrs Mary M Thorndike before me this 3d day of December 1838, at the County of Washington on the District of Columbia. 1. Are you acquainted with the parties to the above suit & if yea how long have you known them. 2. State fully your knowledge respecting the above petitioner, whether he is free or a slave, & if the latter whose property he is and has been during your knowledge, where born and raise, & when & under what circumstances he has since been. 3. Do you know anything of any trip of said petitioner from Maryland to Virginia, or from Virginia to the City of Washington and if the circumstances attending the same and the duration of stay, and whether any such trip or stay was with the sanction or assent, or against the will and wish of the defendant, Miss Clarissa Purnell? State all your knowledge on these subjects fully and at large. 4. Do you know anything further material for the defendant. if so state your knowledge fully and precisely. 1st What is the age of Miss Clarissa Purnel & who would be her heirs if she should decease? 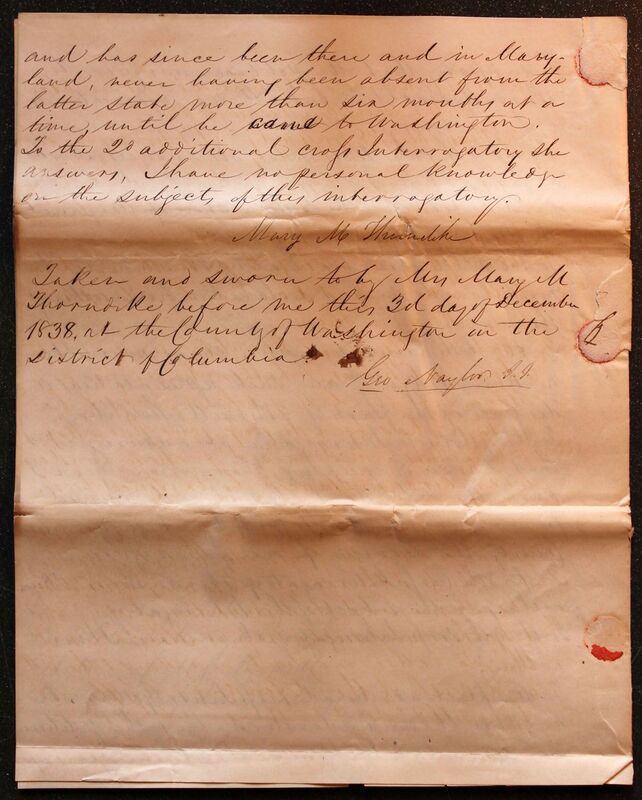 3rd State fully the cause & reason of I. Purnell Pendleton's taking with him to Virginia the petitioner & whether Miss Purnell did not give the petitioner absolutely to I. Purnell Pendleton? 4th Where has I. Purell Pendleton resided during the last seven years? 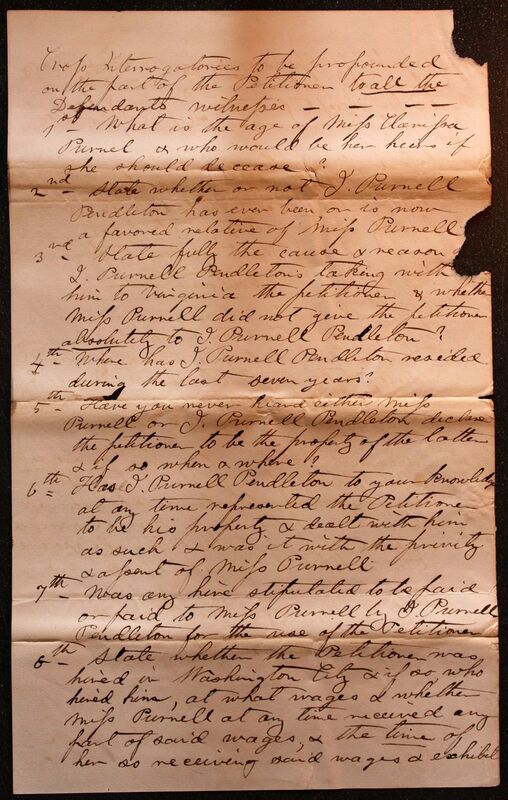 5th Have you never heard either Miss Purnell or I. Purnell Pendleton declare the petitioner to be the property of the latter & if so when & where? 9th State fully any other matter or thing which would benefit the petitioner on the trial of said cause, the same as if specially interrogated thereto? 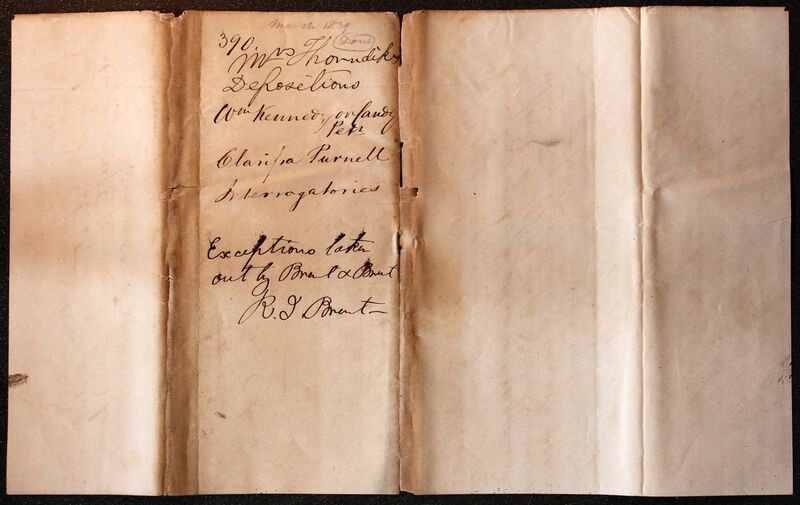 1st When & in what year did I. Purnell Pendleton take the Petitioner to Virginia & where did the Petitioner remain between that time & his being sent to Washington City?